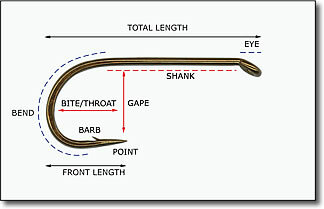 Gape: Gape (or Gap) is the distance between the hook shank and the point. The standard gape is slightly less than half the standard hook shank length. Hook sizes are based upon gape. Wire Gauge: There is a standardized wire guage. From this standard, hook wire can be heavier (XH) or lighter (XF) based upon an "x" system. A 1XF hook would have the same wire diameter of a hook one size smaller. Shank: The shank is the part of the hook from behind the eye to the beginning of the bend, which is usually directly above the space between the point and the barb. Standard shank length is defined as the distance of twice the Gape plus the width of the eye. An "x" system designates longer or shorter than standard lengths. Each "x" represents one hook size, so a size 6, 2x long (2XL) has a shank length of a standard size 4 hook. A size 6, 2x short (2XS) would have a shank length of a standard size 8 hook. Almost all fly hooks are even-numbered only, however, the "x" designation is determined by individual digit sizes. The shank can be straight or curved. Eye: The eye is the ring, hole, or loop at the end of the shank which the line is attached. Eyes can be positioned straight, up, or down. Bend: The curved portion of the hook ending just before the point. Bends can be round, limerick, sproat, or reversed offset. Bite/Throat: The distance from the apex of the bend to its intersection with the gape. Point & Barb: The point is the sharpened end which penetrates the fishes mouth. The barb is a projection that extends backwards to secure the hook. Hooks can have a mini-barb or be barbless.